Judy learned to quilt at a young age. After becoming a healthcare professional, she uprooted from NJ and headed to Montana! There Judy earned her Bachelors and Masters Degree in Nursing. She also experienced many western type jobs including, Lambing, Taxidermy, Fishing guide, and even Wrangler! She also spent time in Chile and Alaska. Judy enjoyed a successful career as a Family Nurse Practitioner and cherished the views from her 20 acre ranch near Bozeman Mt. Here she became reacquainted with Quilting. After teaching many of her friends, how to quilt, she started a small business with a friend." All Patched Up" sold original designs, packaged in kit form, at home parties. Judy's home also became the venue for weekend quilting gatherings, featuring great food and fun times! As difficult as it would seem for Judy to leave Montana, the health of her parents required more of her participation. In 2005, she returned to New Jersey. While awaiting the transfer of her medical license, she found that Bernina Dealers were just too far away. She decided that if she were granted a Bernina Dealership, she would open a quilt shop. In August 2006 Judy had a Bernina Dealership, a Long Arm Quilting machine and 300 bolts of fabric! In 2007 she added a second Long Arm machine. In 2009 she moved to a larger shop. In 2010 she added an adjoining building. In 2011 two computerized Long arm machines and another Long Arm. 2013 saw her add another building and 2 16 needle commercial embroidery machines. 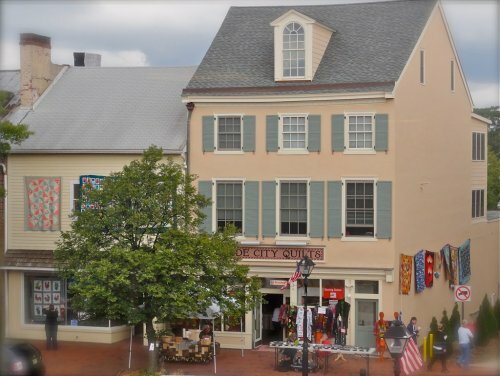 Visit Olde City Quilts® where now 8000 bolts of fabric await your visit! From Big Sky to Burlington! In 2005, Judy, having lived primarily in Montana for twenty two years stepped aside from her position as a family Nurse Practitioner. She packed up her most cherished belongings and moved back to NJ! Among the items she brought back was her wood burning kitchen stove, her Bernina 1080 her Bernina 165 and the remaining inventory from a small quilt kit business she had operated with her friend in Montana. Soon she began the process of having her Medical license transferred from Montana.This did not go smoothly. Time began to drag on so she began getting her sewing room situated in her new home. It seemed like the perfect time to find her nearest Bernina dealer and have her machines serviced. After a brief search, she was stunned to learn how far away Bernina dealers were. About this same time she made a decision to rent a table at the quilt show in Somerset NJ. She thought she would try to sell off her remaining quilt kits. Judy approached the Somerset show certain that her items would be a flop with an east coast crowd. She was stunned to see how wrong she was. Her little booth at Somerset was quite popular, and enabled her to assemble a mailing list of local quilters. It seemed Judy's professional life was about to change. Judy began looking for locations that would accomodate a nice sized Quilt shop and a soon to be purchased Long Arm Quilting machine, but first she needed Bernina to grant her a dealership. Rob Credits his father with raising him with a strong work ethic and filling him with sayings such as "any job worth doing is a job worth doing right." Rob loved helping his father at his Service Staton in Collingswood NJ. Rob also managed to find odd jobs and had the largest newspaper route in town. Once he entered High School he met the love of his life Judy. He also obtained a job in a local hardware store and credits Charles and Marion Hare for continuing his work life education. After a brief attempt at college, Rob returned to working at his fathers Service Station. He also dabbled in Real Estate investment. In 1987 Rob was offered the opportunity to take a position with the Delaware River Port Authority. Rob also got married at this time and has 3 sons Rob Jr., Cal and Brad. He also worked at FedEx. Rob also drove Tractor Trailers for UPS and JB Hunt. 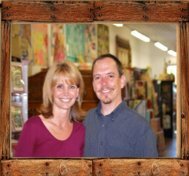 Rob began working on Sewing machines for Judy when she returned to his life and opened Olde City Quilts in 2006. He has specifically been trained by Bernina, Gammill, Innova and Melco. The best thing about owning Olde City Quilts, is my affiliation with Quality companies like Bernina. I remember when I didn't own a Bernina. I thought pulling fabric through a machine was normal. What bothered me most, was that sewing just wasn't any fun! Trying my first Bernina 20 years ago convinced me and I know it will convince you! Come in, test drive a Bernina. We offer great machines at the lowest prices in every price range! When you buy a Bernina here, you'll know you have a quality machine from a shop that believes in, uses and stands behind their products. I want you to enjoy quilting as much as I do. When you're ready to buy, buy the best! Buy the best at Olde City Quilts! I know you'll enjoy your new machine and your partnership with Olde City Quilts and Bernina! We're confident its a combination that can't be matched! Thousands of people have visited us, Come on in and join the crowd!